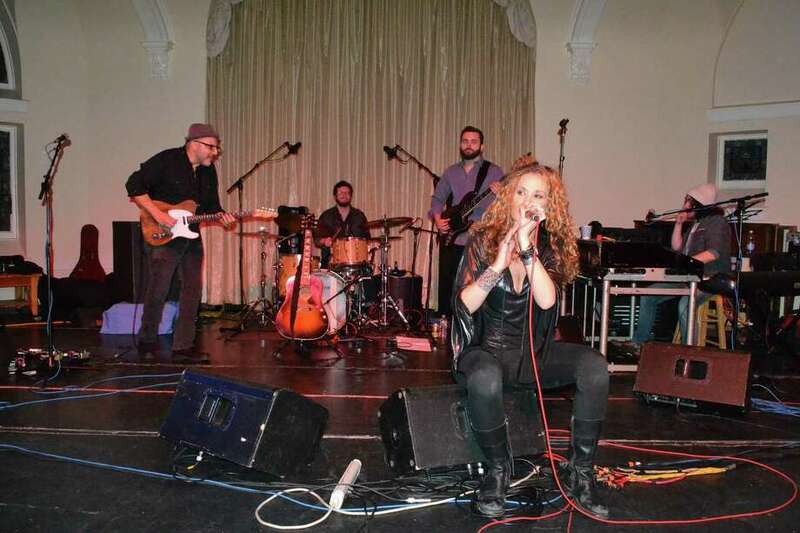 Dana Fuchs, a blues and rock singer performs at the Seabury Center in Westport, Saturday. Last Saturday night, 160 people dined, danced and drank while enjoying the very successful debut of Westport’s newest event: Supper & Soul Downtown Dinner and Concert Series produced by the Chamber of Commerce and sponsored by Mar Jennings. Attendees bought a single ticket for $75, ate a three-course meal at one of five downtown restaurants: Amis, Boca, Rothbard, Spotted Horse and Tavern on Main; saw a professional concert performed by blues and rock singer Dana Fuchs at the Seabury Center; then returned to those same restaurants for happy hour pricing for drinks. Billed as “date night in a bottle,” this first emulation sold out and the goal will be to sell out the next one on April 7. But why does this matter? People have been bemoaning the fact that Downtown Westport is dead at night and that the pace of retail stores closing has increased. This new concept, while only periodic, creates vibrancy. First Selectman Jim Marpe in his State of the Town speech, the very next day, hailed the event as an example of Westport’s economic resiliency and commitment to engagement of the community. Bottom line, the event was an economic shot in the arm to downtown and another experience that makes Westport unique and an attractive place to live and set up a business. As we watch the new mall rise off of Interstate 95 in Norwalk, we know people will be drawn there. It is our job, not just at the chamber, but everyone from businesses to nonprofits, to work toward promoting and ensuring that Westport continues to be the inviting and exceptional place that it is. Future events, such as the Maker Faire and the Great Duck Race, will be expanding into the streets of downtown. The opportunities for retailers to partner up and thus engage with the community will further this goal. The Downtown Merchants Association, too, has new and inventive programs coming. It’s this great collaboration of minds and efforts that will have us prevail. Now that we know Supper & Soul works, look for it to occur about three to four times a year. April 7 will be next. Matthew Mandell is the executive director of the Westport/Weston Chamber of Commerce.